It’s no secret that transport is a tough business. Fierce competition, tight margins and high overheads can take their toll on even the most efficient trucking company. DGL managing director John West is no stranger to the challenges that a transport company faces. The company that emerged as a specialist dangerous goods carrier at the turn of the century has just celebrated 15 years in business. And on the day that DGL turned 15 years old it also took delivery of its 150th Mack truck. However, what did take me by surprise was the devil-may-care grin that lit up West’s face when asked about the last decade and a half in business: "It’s been a blast, it’s been fantastic." DGL came to life in 2000. "There was a niche in the market," West says. "I dabbled in it for a little while, but I found it hard to get traction on a national level." The business sprang to life with two other partners over a long lunch in an effort to gain a presence on the market. Dangerous Goods Logistics, initially started running as a consortium from an empty warehouse in Sydney. "We had no customers, no business, no employees, nothing," West says with some retrospective disbelief. While initially a partnership, according to West the plan was always to buy out the partnership as the business grew. "We got on the road and within two years we had a national business up and running with national clients in every state of Australia." While the business was born around the transport of dangerous goods the company picked up a contract with building materials supplier Stramit in 2002. Which led to the company being renamed DGL Australia in 2004. The company now has 520 employees on the payroll in Australia and New Zealand. "We’ve got a good team of people, you need to have good people around you in this business," West says. "We’ve grown by reputation and by word of mouth." 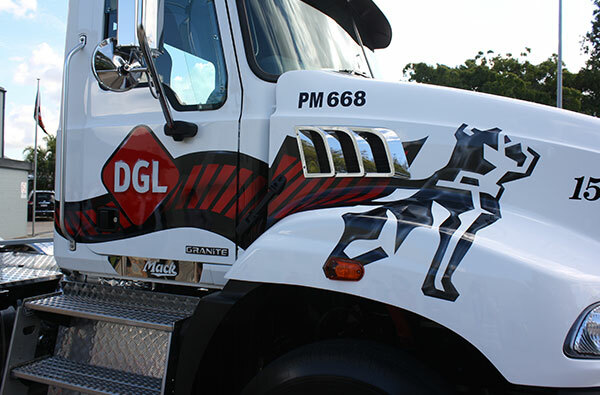 DGL moved into the NZ market in 2009 and the business now boasts 446 trucks on the road and more than 2 million square-metres of warehousing. The company moved into NZ at the request of one of their national customers. And after doing battle with the regulatory bodies to get some innovative and more efficient trailers on the road DGL was able to move forward over the Tasman. "The top echelons of the dangerous goods industry are our friends and our clients," West says. The company doesn’t use contractors as a general rule; West reckons this provides a superior level of customer service and safety. "It’s a level of service thing and the ability to train and have a culture and enforce safety," West says. "Safety is paramount, and Mack trucks and Volvo Group are big players in that." DGL outsources all fleet maintenance with the company: "We don’t even own a spanner". DGL invest heavily in training and all employees undergo e-learning modules and West is keen to keep raising the bar on safety. While drivers of trucks carrying packaged dangerous goods aren’t required to be Dangerous Goods certified, DGL insists, making sure all its dangerous goods drivers are certified, regardless of the load being carried. "It’s a great day, for Mack and DGL taking delivery of our 150th truck," West says. "I just like Macks, but for more than sentimental reasons. They’ve proven to be very reliable, cost-effective trucks and the support from the Mack team has been brilliant, that’s why I keep buying them." The 150th Mack milestone has been celebrated by making the new vehicle just a little different. "I asked Mack about doing an individual paint job and putting some bling on this truck and they put me in touch with Wayne Dawson from Bel-Air. "Between us we came up with the design. "I told him I wanted a big bulldog on it pulling the DGL logo and left it to him. "I love what he came up with and I’m sure the driver will love it too." Also on hand at the handover was Mack’s fleet sales coordinator Tanya Cole. Cole has delivered each of the 150 trucks to DGL. "Tanya’s been absolutely brilliant from the start," West says. "She knows our spec and she makes sure every Mack we buy has the right fittings: radios, air-conditioning, you name it, she makes sure it’s there. "Every truck we get comes with the key in it ready to go to work, we don’t do a thing to them." 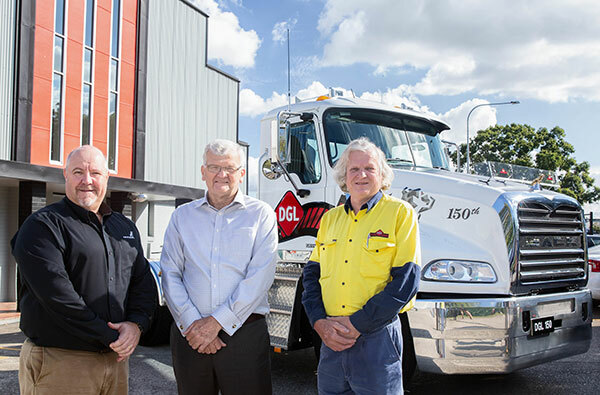 Long serving DGL driver Les Olley was flown to Brisbane especially to take delivery of his new truck. Olley has been with DGL for 13 years and West is more than impressed with how Olley looks after the gear. "You could eat your dinner off the floor of his truck," West says. 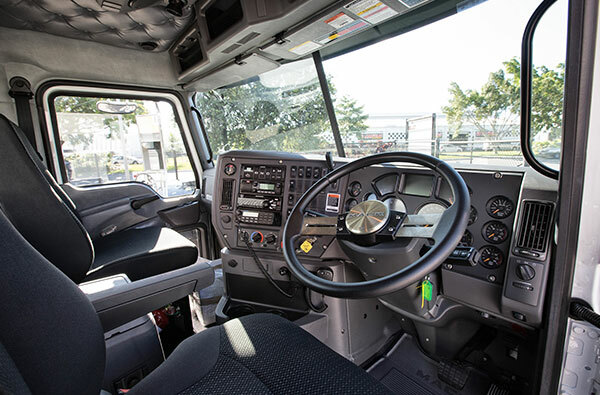 Company policy has always been to give the newest trucks to the best drivers in the fleet. Olley started his driving career in 1973, and that first truck also had a bulldog on the bonnet. He steered a Maxidyne and Quad Box equipped day-cab R600 Mack from Sydney to Adelaide back in the day — though with a wry smile he does admit that things have progressed somewhat in terms of technology and power since then. In the meantime, Olley has clocked up more than a million kilometres since starting with DGL. Having pride in his ride must also run in the family as Olley’s son Dave, who also drives for DGL, was also taking delivery of a new UD with truck mounted crane on the same milestone day. Automated manual transmissions (AMTs) are a big part of the DGL fleet and the company was an early adopter of self-shifting gear boxes. There are now almost 40 mDrive equipped Macks in the fleet and West reckons that there are only now between three and four manual trucks left in the company. While reliability is a big plus, the DGL prime mover fuel economy average is 2.1km per litre on metro and country distribution work. The company generally hangs on to its vehicles for six to seven years. Olley spends the bulk of his time delivering intermediate bulk container (IBC) and palletised goods around the Sydney region. From left, Dean Bestwick, vice president Mack Australia, DGL managing director John West and long serving driver Les Olley try to not look too excited about the new Mack Granite. 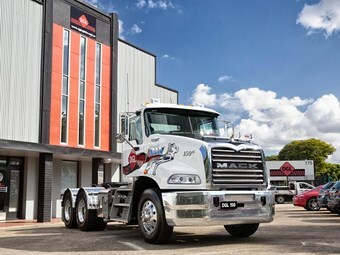 As it stood gleaming in the Queensland sunshine the new Mack Granite did indeed make a striking sight resplendent with its custom paint job. Under the gold doggie lies a 435hp (324.4kW) MP8 engine backed by the obligatory 12-speed mDrive AMT. And as befits the gold dog Mack diffs and suspension complete the driveline. This Granite also sports an underslung exhaust. Another feature that caught my eye was the custom step for easy cab entry and exit, which is a useful addition for multi-drop roles. While I may have been admiring the new truck from afar it was hard not to see the glint in Olley’s eye as he took in his new ride. I reckon that DGL’s 150th Mack is going to be in safe hands indeed. DGL managing director John West is big on promoting prostate cancer awareness. So much so that DGL has become a part of spreading the word by branding some company trailers with the Prostate Cancer Foundation of Australia (PCFA) message. The Big Aussie Barbie aims to aims to spread the word on prostate cancer, a message that is close to West’s heart. "I have experienced prostate cancer and understand what thousands of Australian families go through when they receive a diagnosis and navigate their way through the whole treatment process. "PCFA helps people get through these difficult times and now it is time for our company to give something back to this important cause," West says. "DGL operates in a very male-dominated sector so this is the perfect campaign for us to support via our fleet. "We hope people take notice of our trucks and go onto support the Big Aussie Barbie campaign in their own ways." Australian cricket legend Matthew Hayden is an ambassador for PCFA, and is helping raise money and awareness through the Big Aussie Barbie campaign.